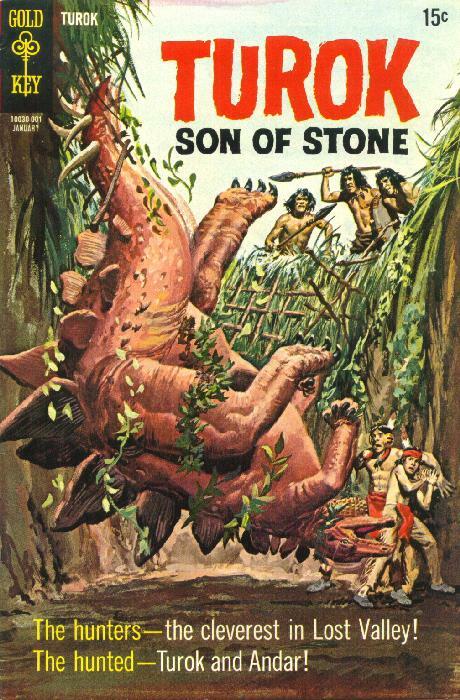 Yet another great Turok cover. Shayne has one day to find a young woman due to inherit a fortune--a fortune that provides a pretty solid motive for someone to prevent the woman from ever being found. Boris Karloff played Frankenstein's Monster three times, bringing pathos and humanity to the role. It's always been fascinating to me that for the rest of his life, Karloff received fan mail from children that were addressed to the Monster. "I know you are always scared, but if you came to my house, we could play and no one will chase you and you won't have to be scared anymore. I will be your friend." 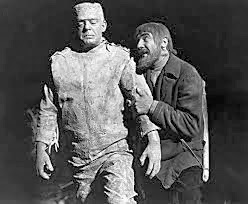 But by the time The Ghost of Frankenstein came along, Karloff had decided to retire from the role. So Universal turned to their other monster movie star--Lon Chaney Jr. Though usually best suited for supporting roles, Chaney had done a magnificent job a year earlier as Larry Talbot in The Wolfman. 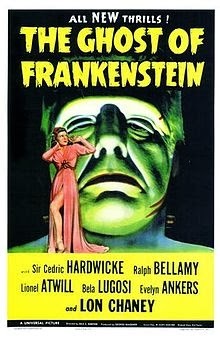 The Ghost of Frankenstein marked the series descent from A-picture territory into the realm of B-Movies. But, as my 1 or 2 regular readers know, I have a real love for the straightforward storytelling we find in the world of B-Movies. Ghost doesn't have the mythic power of the earlier films, it's still tells a good story. Bela Lugosi reprises his role as Igor, the Monster's manipulative but only friend. I think this is Lugosi's best role--we never doubt he's evil, but we also never doubt that he really does consider the Monster to be his friend. Of course, that won't stop him from looking out for himself no matter what. Igor was supposedly shot to death in the previous film (1939's Son of Frankenstein) and the Monster was knocked into a searing-hot pit of sulfur. But we soon find out that both had survived. Igor takes the Monster to the village of Vasaria, where a son of the original Doctor Frankenstein works as a brain surgeon. Soon, several people are dead and Igor is pretty much blackmailing Frankenstein into helping the Monster. This leads to a plan to replace the Monster's damaged and evil brain with the brain of one of his victims--Dr. Kettering. It's all great fun, with the story jumping around from one plot point to the next in an internally logical manner. Chaney doesn't elicit quite the same level of sympathy that Karloff brings to the role of the Monster, but he still gives us a worthy effort. A scene in which he befriends a young girl come closest to emulating a Karloff-like moment. 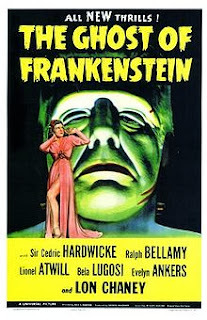 The rest of the cast do fine jobs, most notably Lugosi and Lionel Atwill as Frankenstein's less-than-ethical assistant. The black-and-white photography and the lighting are wonderful, giving the movie the proper atmosphere. Despite the drop in quality when compared those made in the 1930s, I'm glad The Ghost of Frankenstein and the later films were made. 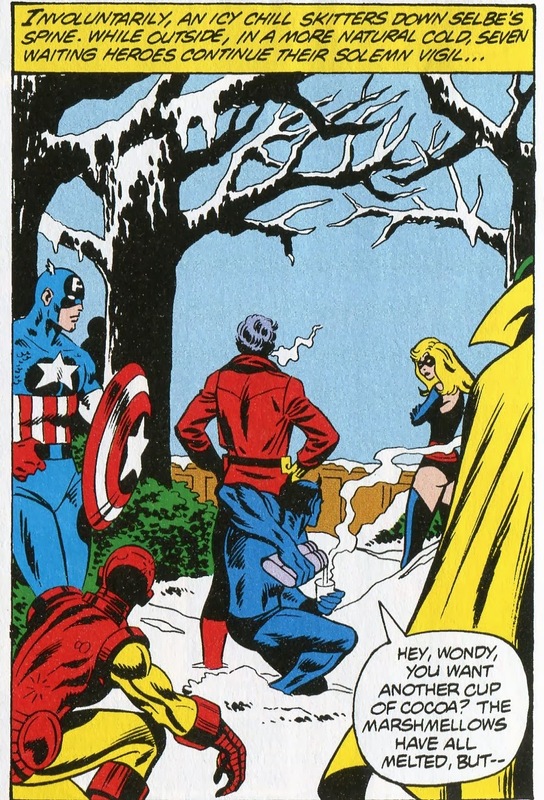 Seriously, for most of two issues, the bulk of the Avengers in this story arc were standing around in the snow, drinking cocoa or coffee and talking about stuff. It's not that they didn't have reason for doing so--they were on stake-out and the whole story has a strong plot, with events unfolding in a logical manner. And, despite the fact that most of the heroes spend most of the story standing idle, there's still plenty of action peppered throughout. 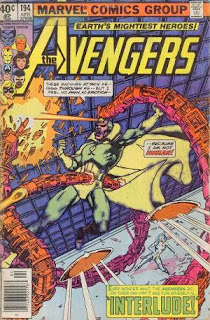 It begins in Avengers 194 (April 1980). The team is regrouping after finally getting a judge to agree that they didn't require government oversight on everything they did. This is an interesting issue--there are a few pages to set up the story that will really begin in the next issue, but most of it is fairly quiet interactions between the various characters. There's a few not-so-quiet interactions as well, such as the Vision working out some of his frustrations in the Mansion's training room. It's the sort of issue that would probably be a terrible one to use to introduce a new reader--there's simply not enough happening to interest a reader who isn't familiar with the characters. But for a regular reader, it's great stuff. 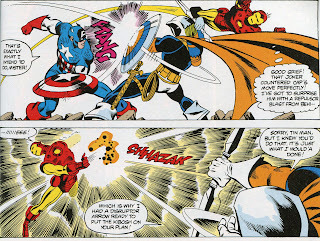 David Michelinie, the writer, does a truly magnificent job of giving each of the Avengers a distinct personality and them having them play off each other in believable ways. Marv Wolfman is the only other writer from that era who had a comparable talent in this area. It doesn't hurt to have an artist like George Perez making everything--even the quiet scenes--look awesome. Anyways, a guy named Selbe shows up at Avengers Mansion, claiming that someone is trying to kill him. But he's an escapee from a mental institution and, when guards from that institution show up with a court order, the Avengers are obligated to hand him over. Most of the Avengers are okay with this--Selbe really did seem to be a visitor from Crazy Town. But the Wasp isn't so sure this is all on the up-and-up. She goes off on her own to investigate. In Avengers #195, the other Avengers follow her. 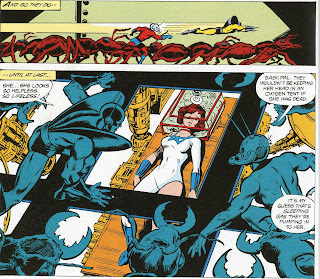 This is where the stake-out begins--they don't have enough evidence to just blast their way into the institution, so Yellowjacket (Hank Pym's current identity) and guest-star Scott Lang (the new Ant Man) sneak in for a look. 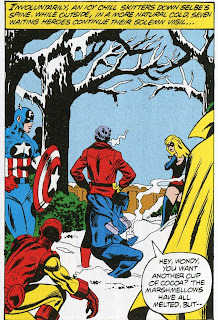 In the meantime, Michelinie gives us more great character interaction as the Avengers wait for better information before taking action. 1) Wasp is being held prisoner. 2) Selbe is a fast-grown clone whose heart is going to be removed to save the life of the elderly head administrator. 3) The institution isn't for mental patients, but its main purpose is to train henchmen, who are then hired out to various supervillians. The whole "cloning someone to provide a heart donor" thing is simply a side issue. It's this last part that makes this a favorite story of mine. Villains in various comic book universes all seem to have an endless supply of henchmen. I suppose if we thought about it, we'd simply assume that the henchmen are being recruited from whatever low-level criminals happen to need work. But when you think about it, in a comic book universe there is money to be made in training henchmen and then contracting them out to guys like Doctor Octopus. Henchmen are essentially cannon fodder--even if your evil plan works, you are probably going to lose a fair amount of your guys to the superheroes, SHIELD or the cops. So you are going to need a regular supply of replacements. It's a real need and there's money to be made filling that need. 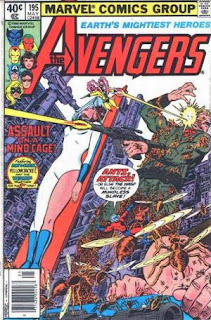 Moving on with the story: Yellowjacket and Ant Man spring the Wasp and we get plenty of action as they take out a bunch of henchmen and try to spring Selbe. But that goes awry when the head of the school shows up and takes all three of them down. 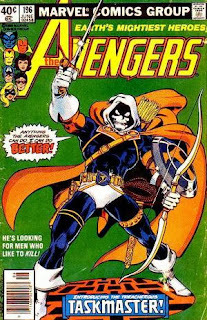 1) George Perez gives us a great visual design for Taskmaster. 2) His "photographic memory" origin--allowing him to replicate acrobatic and fighting moves perfectly after seeing them once--is clever and original. 3) His villainous philosophy is refreshing. He's not driven by ego or revenge, but he's in it simply for the money. He'll fight you and kill you to protect his commercial interests or to make an extra buck, but he otherwise has no problem with running away. Taskmaster has a completely mercenary outlook on life--an action is either profitable or not profitable. That's his only decision-making criteria. Now this isn't a criticism of great characters like the Joker or Lex Luthor, whose actions often are driving by revenge, ego or pure insanity. These things are appropriate for those characters, but it is refreshing to run into someone like Taskmaster every once in awhile. For him, it's all about the money. That leads to the final showdown, with the Avengers cleaning up the small army of henchmen and trying to run down Taskmaster, who escapes to make money another day. He'd reappear about a year later in an issue of Marvel Team-Up, fighting Spider Man and Ant Man. This story arc appeared in 1980, towards the tail end of the era in which comic books made a real effort to simply be fun. That doesn't mean there wasn't good characterizations and the occasional dose of tragedy or angst when these were needed. But pick up an issue of a Marvel or DC comic at the time and odds are the writer and artist were making a real effort to tell a fun story. Whether or not they were successful in any one story, they all got an A for Effort. But soon we would have Mutant Massacres and endless Crises and rapes and destroyed marriages and heroes who become anti-heroes for no good reason at all. The success of The Dark Knight Returns and The Watchmen would spill over into the mainstream comics and everyone would simply forget how to have fun. That's a slight exaggeration, of course. There are still writers out there who remember the concept of fun. 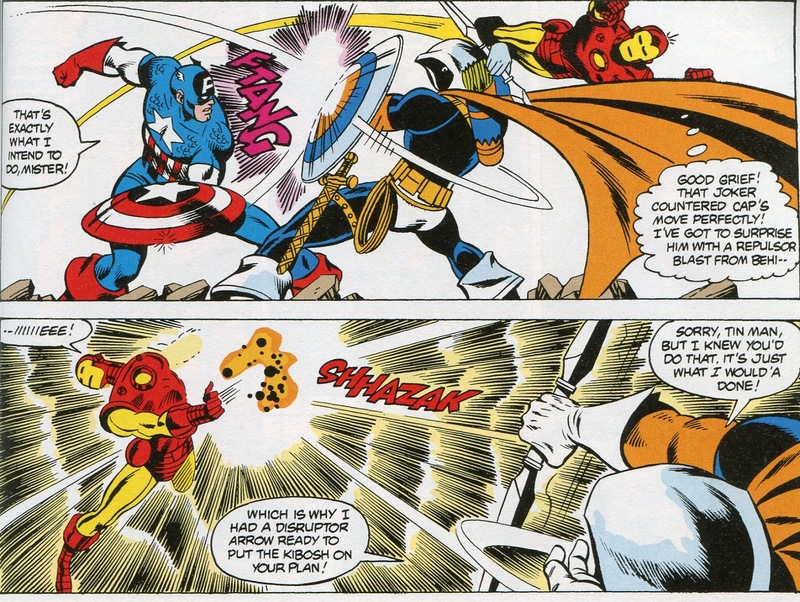 A few years ago, the kid-friendly Marvel Adventures series was wonderful--especially their Avengers book. Today, Batman '66 is a book brilliantly recreating the world of the Adam West TV series. There always seems to be one or two worthwhile superhero books on my pull list. And over the past few decades, animated cartoons such as Batman: The Animated Series or (more recently) Avengers: Earth's Mightiest Heroes have been great. So there's still good superhero stories out there. Perhaps the concept of having fun will make a comeback in the bulk of the mainstream books. I'm not holding my breath, but it could happen. This is one of many evocative covers drawn by Luis Dominguez for Weird War Tales. A nicely atmospheric tale about a treasure ship that sank over two centuries ago-- or did it? he plays a scientist who isn't mad at all. Well, not mad-crazy. 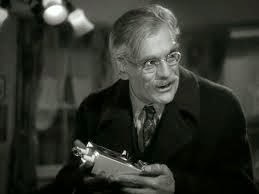 David Mallory (Karloff) does get mad-angry when the owner of a private security company uses a technicality in a contract to get out of paying Mallory a lot of money. Mallory has a way to fight back, though, using a new device he's invented to disable burglar alarms installed by the security company. He then breaks in to various businesses without stealing anything, but leaving taunting messages signed "Night Key." A small-time crook appropriately named Petty Louie is helping out Mallory, though he's constantly annoyed that he's not allowed to steal anything. Thinking that he's helping Mallory out, he contacts The Kid--the youthful leader of a gang of criminals. This actually doesn't help much. Mallory is soon being forced to use his Night Key for actual robberies. He manages to outsmart the crooks once, but then they kidnap his daughter to force his cooperation. That doesn't mean he's not willing to out-smart them again, but now there's a lot more at stake. blind without his glasses and physically feeble. There are moments in the film when Karloff uses these traits to exude a deep sense of helplessness. But Mallory also has moral courage, a fair dollop of physical courage and the ability to continually think his way out of trouble. He can't match the crooks physically, but perhaps he can get the best of them anyways. The supporting cast is great as well. Hobart Cavanaugh really makes us believe that Petty Louie begins the story as a hapless crook but ends it as someone willing to risk his life for a friend. Members of the gang include Ward Bond (one of my favorite character actors) and Frank Reicher (Captain Englehorn from King Kong). Jean Rogers (Dale Arden from the first two Flash Gordon serials) is Mallory's daughter. This movie was made because Boris Karloff was contracted to be used in one more movie at Universal Studios, but the new owners thought the horror genre (Karloff's usual oeuvre) was dead. A few years later, the Universal executives would green-light Son of Frankenstein and discover the horror genre still had some life in it. But perhaps that gap in making horror films was a fortunate one. Because of it, we got movies such as Night Key. And the world would be a poorer place without it. 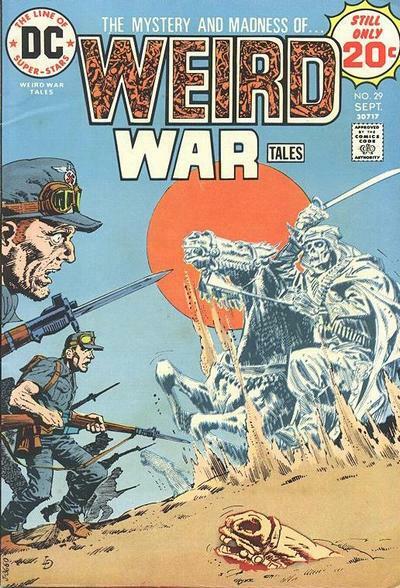 Jonah Hex, the hideously scarred bounty hunter, first appeared in All-Star Weird Western #11 (March 1972). 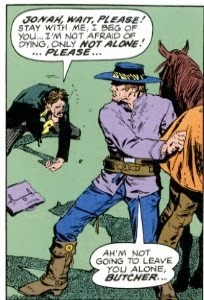 Writer John Albano and artist Tony DeZuniga obviously had Spaghetti Westerns in mind when they created the character. In fact, as I said in another post, if a Jonah Hex movie had been made in the 1970s, Clint Eastwood is the only actor who would have been right for the part. Jonah introduced a more raw and brutal Western hero into the comic book genre. Hex was still kind-of, sort-of a good guy--he hunted legitimate crooks and he would help the innocent (though he'd often be ill-tempered about the necessity of doing so). But he did have a brutal streak--perhaps most noted in his tendency to bring his own personal brand of justice down on the heads of evil-doers. 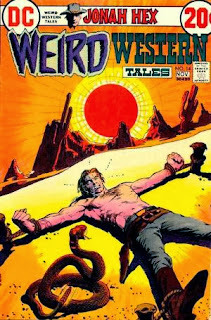 All-Star Weird Western become Weird Western Tales beginning with the 12th issue. Jonah acquired a pet in that issue--a timber wolf named Iron Jaws. 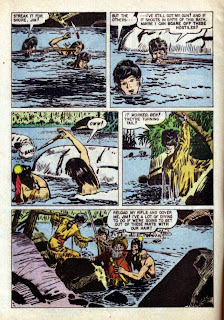 This is fortunate, because in Weird Western Tales #14, Iron Jaws saves his life twice in the course of a 12 page story. The tale begins with Iron Jaws killing a rattler, but getting bit in the process. Hex takes the wolf to the nearest town and insists the local doctor treat him. But he's recognized by the two outlaw brothers of a guy Hex once killed. They slug him and take him into the desert, leaving him strung out under the hot sun to die. Only another appearance by Iron Jaws, who uses the last of his waning strength to follow, saves Jonah's life. The wolf dies just as he finishes chewing through the ropes. Hex holds the two outlaws responsible. When he tracks them down, he kills one and leaves the other to die an appropriately horrible death. 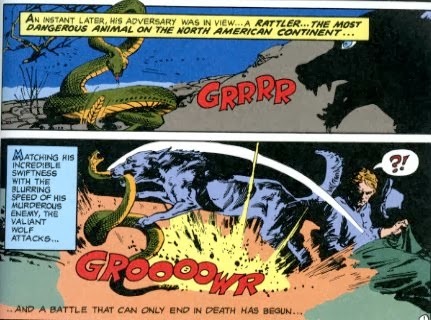 The original Jonah Hex stories were short, sharp tales with a lot of emotional bite mixed in with the overt violence. Jonah is one of those characters that is interesting to think about. As portrayed by writers such as Albano and Michael Fleisher, he's without question Made of Awesome--he's the death penalty personified and those who fall before him clearly deserve it. 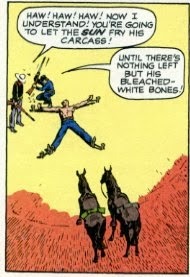 On the other hand, his personal sense of justice leads him to do some pretty brutal things--such as allowing a rabies-infected man to die alone in the wilderness as vengeance for the death of an animal. The heck with all that due process and fair trail nonsense. If Jonah existed in real life, he wouldn't be all that admirable. But perhaps that's one of the functions that fiction serves--we can get a more immediate and visceral sense that criminals are being properly punished than we do in real life. In reality, vigilante justice does not work out that well, but in a fictional universe, where the writer can make sure the bad guy really has it coming, we tend to be more accepting of it. And, since most of us are sane enough to know the difference between real and pretend, this might not such a bad thing. I certainly know the difference between real and pretend. Jonah Hex, sadly, is pretend. Not at all like Two-Gun Kid and Phantom Rider. Those guys were real, of course. 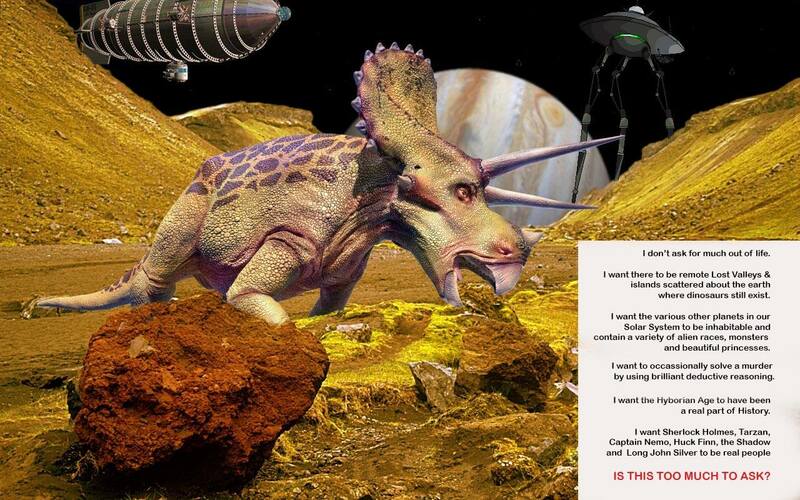 Alien bugs vs. dinosaurs. I need to get this one put on a T-shirt. The mystery here is fairly straightforward, but a sequence in which Nick's lovely assistant Patsy plays decoy to trap a gang of apparent vampires is very intense. 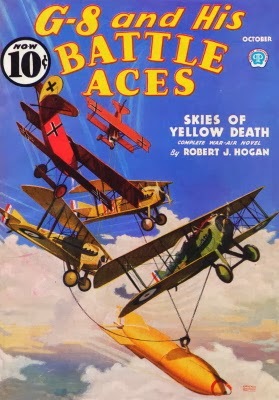 As I understand it, writer Robert J. Hogan (who wrote all 110 issues of G-8 and His Battle Aces) would get a look at a cover painting by Frederick Blakeslee, then write a story that fit that illustration. It's a pretty gosh-darn cool image, which is typical of Blakeslee's imaginative illustrations. That's G-8's Spad in the foreground, with his two Battle Aces helping to haul that mega-bomb somewhere. Obviously, the Germans are upset with them because of this. If this particular image came before the story, then the end product is all the more interesting. Because the whole "towing a mega-bomb" thing doesn't happen until the last few pages. And for most of the story, the existence of the bomb isn't even hinted at. I think it's possible that Hogan had a story idea he wanted to use, then modified it to fit that mega-bomb image in at the conclusion. Heck, maybe he'd had the story idea kicking around in his brain for awhile, waiting for an image he could use as an excuse to write it. Or maybe he simply took the idea of the mega-bomb as his reverse starting-point and constructed the story backwards from there. In any case, he came up with a strong and exciting plot. Skies of Yellow Death begins with Allied ace pilots suddenly dropping dead. All at the same time. And after they had all received notes warning them they would die at the precise moment they did. G-8 looks into it, soon learning of a Chinese scientist named Chu Lung who has gone to work for the Germans. Chu Lung is being brought to Germany in a U-Boat. When the Master Spy and his men try to destroy the U-boat, G-8 is shot down. His ensuing unplanned dip in the North Sea leaves him with a nasty case of pneumonia. So G-8 spends the bulk of the story stumbling around, weak as a kitten, while trying to figure out how Chu Lung is poisoning Allied pilots and where he's located. G-8 receives his own death threat, so he's got to avoid an assassination attempt while pursuing the case. At one point, G-8 is captured and trapped in a coffin, not knowing if he's going to be buried alive. Not long after that, the Master Spy finds himself in a traditional death trap (spiked walls closing in on him) inside the mansion Chu Lung is using as a headquarters. It's not until the last few pages that G-8 learns about a giant poison-gas bomb that will devastate the Alllied armies. Stealing the bomb and dropping it on German troops suddenly becomes a top priority. The story is fast-paced fun, as most G-8 tales are. What makes this one work is the effective way Hogan weaves several plot threads together to generate suspense, then adds the fact that G-8 is sick as a dog to make it even more suspenseful. It may have taken Robert J. Hogan the entire novel to finally fit the image from the cover painting into the story, but it was well worth the wait. Who knew Time Travel would be so AGGRAVATING? The Time Tunnel only ran for one season (1966/67), but it was a rare TV show during the 1960s that didn't get a comic book adaptation no matter how brief its run. 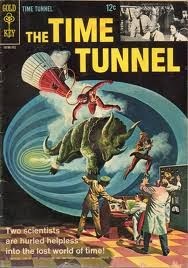 The Time Tunnel comic, in fact, managed a two-issue run. Both had amazingly cool covers painted by George Wilson and both had nice interior art by Tom Gill. And the stories (written by Paul S. Newman) teach us an important lesson about time travel--if you travel to the past, prepare to have the most aggravating time of your life. There were three stories in the first issue and two in the second. 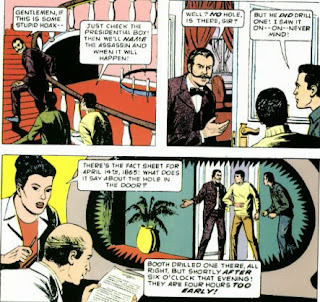 Three of these tales involve Doug and Tony (the two time-lost scientists) desperately trying to warn people about an impending disaster, but failing miserably. In fact, they often end up simply getting themselves in trouble without accomplishing anything useful. 1. The character of Lt. Gen. Heyward Kirk, played by the great character actor Whit Bissell, does not appear in any of the tales. There might have been a legal reason for this, but I suspect that the short length of the stories required the cast of regular characters be streamlined a little. 2. In the TV show, everyone always spoke English no matter where and when the main characters appeared. As in Star Trek, the show broke from reality here to avoid unnecessary storytelling complications. In the comics, three of the five stories are set in places where English would have been spoken. A story set in Pompeii had Doug speaking Latin he learned in school. There's a story involving English-speaking Nazis from the future who were trying to use time-traveling nukes to take out the Allied fleet on D-Day--but maybe they were American Nazis, so what the hey. 3. Writer Paul S. Newman was probably given the premise of the show without any details about individual episodes, because the comic and the TV series each have their own versions of Doug and Tony at Little Big Horn, in France on D-Day and on a rocket in the future heading for Mars. Also, both media had a Lincoln assassination story, but the TV show had Doug and Tony foiling a plot in 1861. 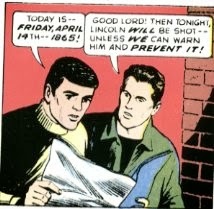 Anyway, on to the story: Doug and Tony find themselves in Washington DC on April 14, 1865--the day Lincoln would be shot. They try to convince the manager at Ford Theater that there's a plot afoot, but (in a nice touch), they remember a detail wrong and discredit themselves. Next, they try to track down the conspirators to find solid proof of their story, but nearly get arrested as sneak thieves. They attempt to warn Lincoln in person, but someone mistakes their mention of assassination as a threat and they have to run for it again. By now, everyone they've met think they're either nuts or assassins themselves. From Doug and Tony's point-of-view, it really is one enormously aggravating moment after another. been in on the conspiracy! Kill them!" They're actually forced to follow after John Wilkes Booth, which simply makes them seem more guilty. Fortunately, they are teleported away by the Time Tunnel scientists just before they get lynched. Of course, they end up in Pompeii just before the volcano erupts and no one listens to them there either. Time travelling really IS aggravating, isn't it? It's a fun, well-constructed story, using the idea that everything they do to help backfires against them to successfully generate suspense. Taking the five comic book stories together, it's possible to see in hindsight that the comic depended too often on the heroes trying to change history when they are fated to fail--it meant that they often didn't get to accomplish anything at all. It might have been better focusing on stories that allowed them to save innocent bystanders or achieve other small victories. On the other hand, one tale does have them saving the D-Day invasion from future Nazis, so perhaps that made poor Doug and Tony feel a little better about time travel. 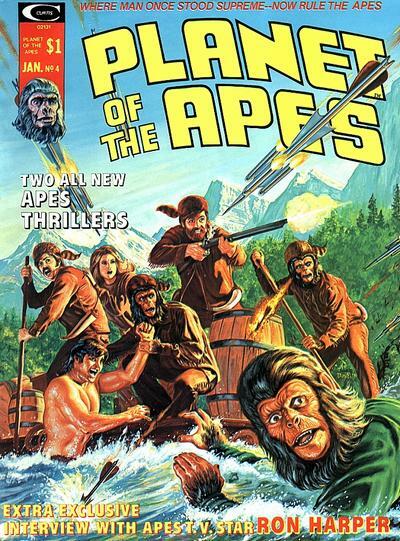 In the early 1970s, Marvel Comics got the rights to adapt Planet of the Apes into a comic book. They started with this black-and-white magazine. 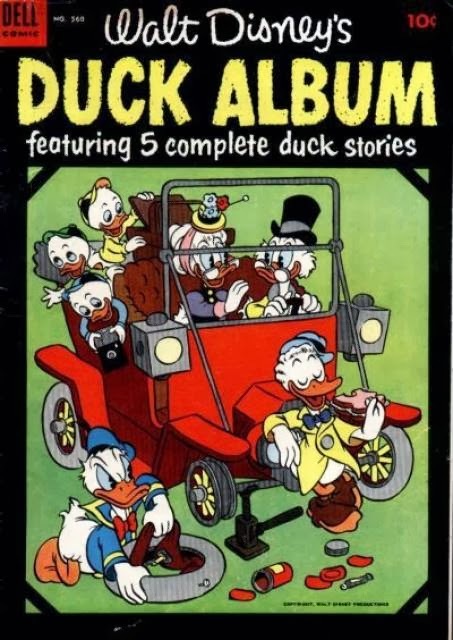 Each issue contained two stories. One story was an ongoing adaptation of the movie series. The other was an original story set either at some point before the movies or in an alternate version of the POTA universe. I'm not sure which. I wouldn't mind seeing this alternate/prequel story arc reprinted one day--I have fond (if vague) memories of it. A picture of a guy standing over a murder victim with a gun seems to be all the proof needed to solve the case. But Casey soon discovers that pictures can indeed lie. A few days ago, I enabled a feature on this blog allowing comments to be made via a Google+ account. I thought this was simply adding an additional route for anyone to leave a comment, but I didn't realize until today that it meant ONLY Google+ comments could be left. Someone trying to leave a comment without a Google+ account would be unable to do so. That's just silly, so I have now disabled it. Of course, my blog has a small readership, so I only get occasional comments. But if any of you were trying to leave a comment recently and couldn't, you should now be able to do so. Gee whiz, but our real-life solar system is BORING! Okay, it's really not--it is, in fact, often quite fascinating and efforts to explore it (the Cassini probe around Saturn; the Mars Rover crawling about the Red Planet, etc) send back a myriad of beautiful images to continually awe us. 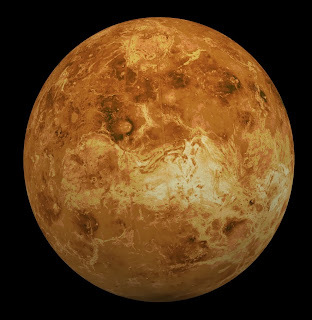 Venus in real life. Not a swamp or a dinosaur to be found. Sigh. But there's a part of me that's always a little disappointed with all that. We recently looked at the Mars and Venus novels of Otis Aldelbert Kline, which presented those planets were inhabitable, full of savage people, strange aliens and hungry monsters. Edgar Rice Burroughs did the same thing with those two planets and threw in a race of skeleton people from Jupiter as well. Now THAT'S the Solar System I want. After all, the Solar System is a big place. We can fit in a few alien races and a horde of monsters and still have plenty of room left over for us puny humans, can't we? The science fiction pulps gave us many different versions of that Solar System. Many of these appeared in Planet Stories, a pulp magazine that holds a very special place in my heart. Between 1940 and 1964, Brackett wrote at least 35 stories set within a version of our Solar System in which Mercury, Venus, Mars and several moons orbiting Jupiter or Saturn were all at least partially habitable. Many of these worlds were the homes of several intelligent races--some human and others more alien. 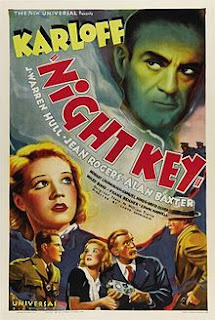 It's a dangerous place to live, but in terms of providing a platform for great adventure stories, it scores a 9.8 on the Karloff/Bogart Coolness Scale. 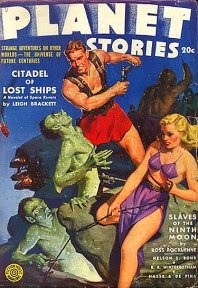 The March 1943 issue of Planet Stories gave us "The Citadel of Lost Ships" (available online HERE). The main character is a human hijacker named Roy Campbell, a criminal successful enough to be one of the most wanted men in the system. When the story opens, he's in the swamps of Venus, hiding out with a race called the Kraylens. These are a people who once befriended him and saved his life. But now its the Kraylens who are in trouble. Valuable minerals have been discovered on their land and they are going to be forcibly displaced by the industrialized forces of the Terra-Venusian Coalition Government. Well, Campbell might be able to help them. He knows there's a rather odd ship near Venus at the moment--a large ship that's actually made up of scrap and the hulks of older ships. These are the Romany--the various alien races who have also been displaced by the advance of civilization. Now they wander about the system, trading for the materials they need to survive. Maybe the Romany can also take in the Kraylens. But when Campbell tries to arrange this, he walks right into the middle of a civil war aboard the Romany ship. Determined to still help the only people who ever helped him, Campbell takes on the responsibility of helping one side win the war so that the Romany ship can retain its freedom. He also needs to spring the Kraylens from a detention camp while he's at it. Helping him out are a female human rebel, a Martian with a hook-hand, and two Outer Planet natives with unusual psionic abilities. He might be able to pull this off, but how much of his own freedom is he willing to lose in order to succeed? It's a great story, full of action, plot twists and strong characterizations. And, darn it, why ISN'T the real solar system more like that? Space gypsies, man--SPACE GYPSIES. There's really no excuse for us not having a band of space gypsies plying the vacuum between our planets, is there? 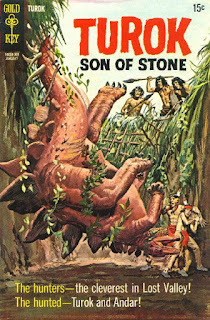 Well, obviously between Kline's novels and this, I'm geeking out on Sword-and-Planet stories right now--which means I must force the rest of you to suffer for it. The stories Brackett wrote set in her Solar System were not written with any particular chronological order in mind and there's no established time line for them. So I'm going to pick out a few stories based on location rather than time frames. We will be taking a look at the four stories Brackett wrote set on Mercury--picking these particular tales pretty much because I recently bought an ebook which collects them. Because of the lack of an internal chronology, I won't make it part of the "In Order" series. 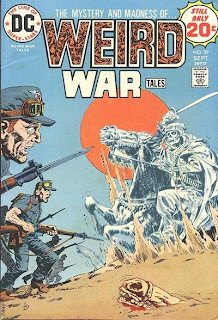 Instead, it'll be a occasional series also appearing on Thursdays, much like the series on certain Robert E. Howard stories I did over the last year. So keep your sword and your ray gun handy. You'll be needing them. Arguably, the 1950s were the true Golden Age for comic books. First, there was some really magnificent storytelling in the medium at that time. Second, there was probably more variety in terms of different genres during the 1950s than any other time in the history of the medium. My personal favorite characters from the decade were Scrooge McDuck and Turok (now that'd be a bizarre team-up, wouldn't it?). But there were many, many characters who left their mark. Ben Bowie and His Mountain Men, for instance. 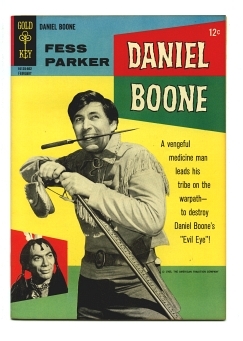 He first appeared a half-dozen issues of Dell Comics' Four Color, then got his own title. His book took the six Four Color appearances into account and began with #7 and ran through #17. Ben was active in the 18th Century American wilderness, around the time of the French and Indian War. He and his band (young protege Jim, old-timer Zeke and Indian guide Nakah) would travel about to trade goods to Indian tribes for skins. They'd get involved in various adventures along the way. Ben Bowie #16 (Aug-Oct 1958) includes the story "The Forgotten Tribe." 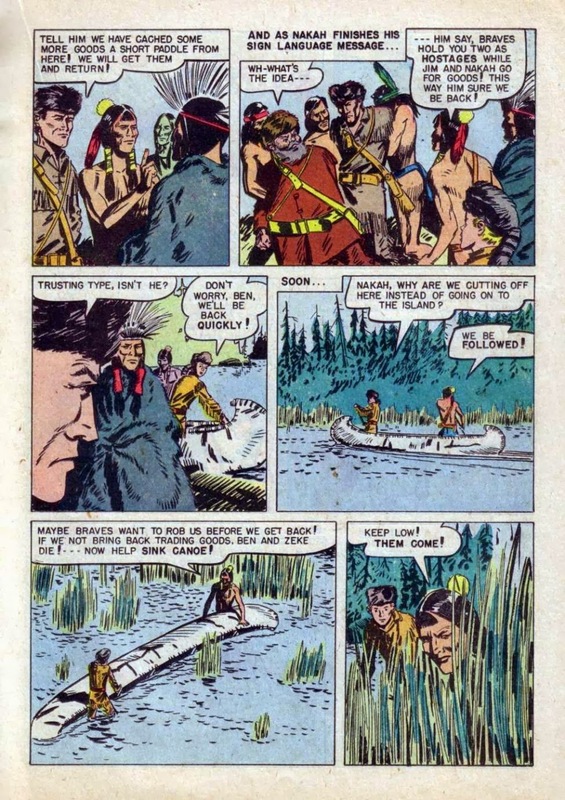 Ben and his men are canoeing along a river when they are attacked by a tribe of Indians they hadn't seen before. They eventually learn that this tribe had a rather unpleasant experience with early French settlers some years ago, then moved into the deep woods to avoid further contact with white men. Ben tries to make friends, but that doesn't go well. 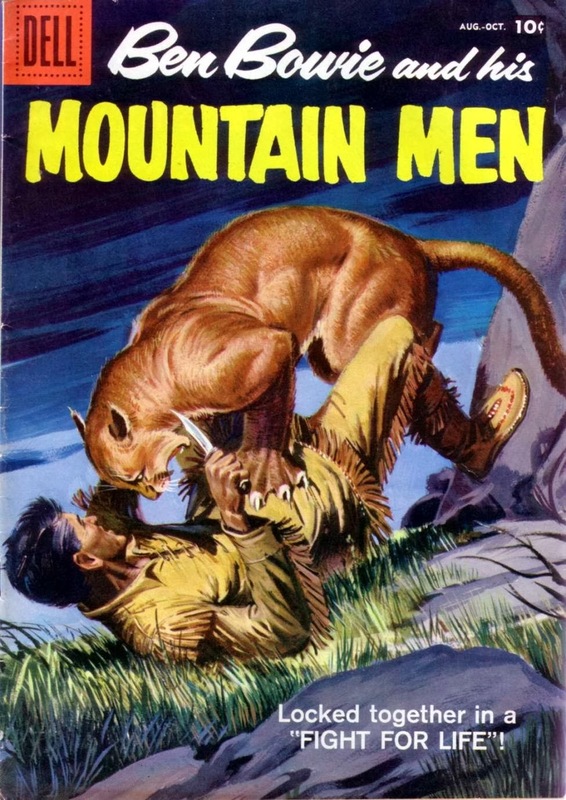 He's about to pull up stakes and leave when he has an opportunity to save one of the locals from a mountain lion. This earns enough good will to open up trade with the tribe. This is undeniably a cliche and a weaker story might have used this as its conclusion. But "The Forgotten Tribe" isn't done yet. When Ben's initial stash of trade goods is gone, a chief orders that Ben and Zeke be held hostage until more goods are brought. This leaves Nakah and Jim with the job of retrieving a cache of goods they had hidden earlier in the story--but to also get back with those goods without being robbed by some pursuers. It's a plot twist that effectively and economically takes the story in an unexpected direction. The early American frontier is a great setting for an adventure series and the storytelling in Ben Bowie is consistently solid and entertaining. Ben's adventures are available to read online here. I don't normally care for photo covers, but that's a great shot of Fess Parker.